Submitted by Tina: Two framed photos. 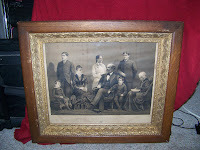 One is a photo of James Garfield and his family, and another is a photo of a political gathering. Submitted by Keyon: I hope you may be able to help me out. 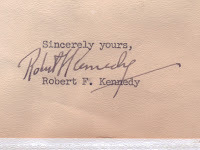 I have a John F. Kennedy Presidential Campaign letter signed by Robert F. Kennedy. 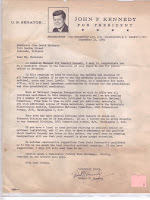 It is typed on US Senator John F. Kennedy for President letterhead, addressed to Honorable John David Upchurch Eldordado, Illinois. It is dated Sept. 15, 1960. If you can provide information to Keyon please click on the "comment" link or email us at appraisals@loriferber.com and we'll be happy to forward the message. I recently came into possession of this photograph of former President JFK. 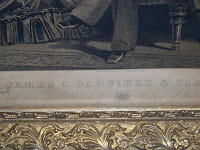 The panel on which it is attached to contains the Presidents signature. 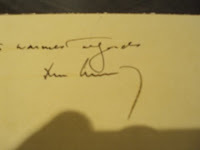 I had this verified by a local coin/ autograph/ presidential memorabilia dealer in the Washington metropolitan area. 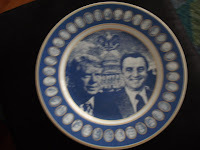 Submitted by Pat: I have a plate from the Porcelain Masterpiece Series with the pictures of Jimmy Carter and Walter Mondale on the front. 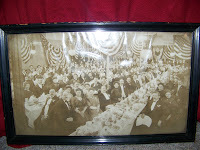 The outside rim of the plate has all former presidents. The front of the plate has a few small scratches. 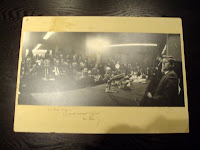 The rear of the plate has the signature of the two men and is shows "January 20, 1977...The Official Inauguration of .... 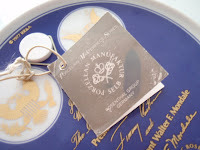 The plate includes the original tag attached to the plate.